What Happened to Tuition-Free College? Senator Bernie Sanders wants it. Until the Vietnam War, most public colleges and universities had it. So what happened to our tuition-free public universities and colleges? UC Berkeley is perhaps the poster child for what has happened to the idea of tuition-free colleges and universities. It is something most other developed countries have for its citizens but no longer in the U.S. And tuition-free higher education -- particularly for taxpayer funded public colleges and universities -- was in the founding charters of most higher public educational institutions. When I entered UC Berkeley as a freshman in the late 1950s, my $300 scholarship covered the first year administration fees. There was no tuition. Today UC Berkeley charges a tuition fee of $13,518 per academic year for California residents. Out-of-state residents have to add an additional $26,682 in tuition fees. That is why students today have accumulated some $1.2 trilion in student loan debt that averages up to $35,000 per the most recently graduate student in a recent Champlain College panel discussion convened on the subject. The total outstanding student loan debt in the U.S. is $1.2 trillion, that's the second-highest level of consumer debt behind only mortgages. Most of that is loans held by the federal government. About 40 million Americans hold student loans and about 70 percent of bachelor's degree recipients graduate with debt. The class of 2015 graduated with35,051 in student debt on average, according to Edvisors, a financial aid website, the most in history. As late as 1960 The California Master Plan developed under Chancellor Clark Kerr supported keeping the UC system tuition-free. How much has changed since then! It's almost as if California has been made to pay for being the vanguard for anti-war and anti-establishment protests during the 1960s and 70s; when it was in wholesale rebellion against the policies of the Cold War, or any war. Why the exorbitant costs for higher education today, and why is it so important to make higher education affordable to most Americans, something that the young people coming to Bernie's rallies also want? The first answer is that it's important to have a well-educated public for a functioning democracy. And Senator Bernie Sanders has made it a central issue in his campaign. "In a highly competitive global economy, we need the best-educated workforce in the world," says Bernie on his website. "It is insane and counter-productive to the best interests of our country and our future, that hundreds of thousands of bright young people cannot afford to go to college, and that millions of others leave school with a mountain of debt that burdens them for decades. That shortsighted path to the future must end." There is also the skills' shortage employers lament about today. 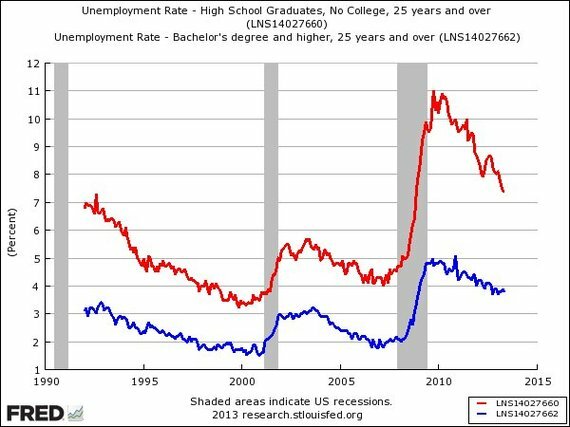 College graduates have the highest employment rate and incomes (blue line in graph)--and the lowest unemployment rate; actually below today's 5 percent unemployment rate. Whereas high school grads have something like a 7 percent unemployment rate, and comparably lower incomes. It is easiest to blame then California Governor Ronald Reagan, who once inaugurated in 1966 began his attack on higher education. It was the beginning of the Vietnam anti-war protests, and he considered UC Berkeley a hotbed of socialism, and inimical to winning the Cold War. It was also the beginning of his government-is-the-problem campaign by shifting state resources away from educating California's students -- firstly, by cutting state funding for higher education, and calling in the National Guard to put down student protests. But there were other reasons for abandoning The California Master Plan to educate all Californians tuition-free than the growing political polarization from the Vietnam War. Proposition 13 was passed in 1978 that limited property taxes, the main source of state and local education revenues. Even then annual tuition and fees for Californians was just $630. The big fee increases began in the 1980s, when California enacted the three strikes law to fight the War on Drugs and began to build a record number of prisons. California's prison population increased 500 percent between 1982 and 2000, according to historian Ruth Wilson Gilmore in her book, Golden Gulag. Monies went elsewhere, in other words. The expansion of educational institutions stopped, despite the surging student population of baby boomers reaching college age. The result has been that state revenues now pay less than 16 percent of the UC University systems' costs, and student tuition fees (and debt) now pay for the majority of education costs. The UC system no longer educates the majority of Californians. This is when a recent McKinsey & Co. report predicts the U.S. workforce will need an additional one million well-educated workers by 2020, when most of the 80 million millennials, children of the baby boomers, have reached college age. Then where will they be educated? From so-called for-profit colleges, which now make up some 25 percent of post-secondary institutions in the U.S. And they provide a much inferior education, as profit is their bottom line rather than a rounded education. Bernie is right on this particular issue. That cannot be, if we are to keep up with the rest of the developed world. It turns out government has to become the solution, the equalizer of opportunity as it once was, if we are to reduce the soaring inequalities of income and opportunity.